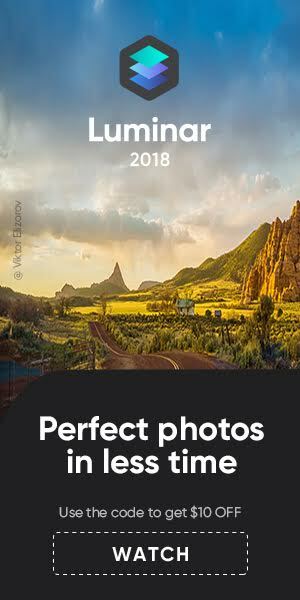 Canon Inc. published the company’s FY 2017 results. 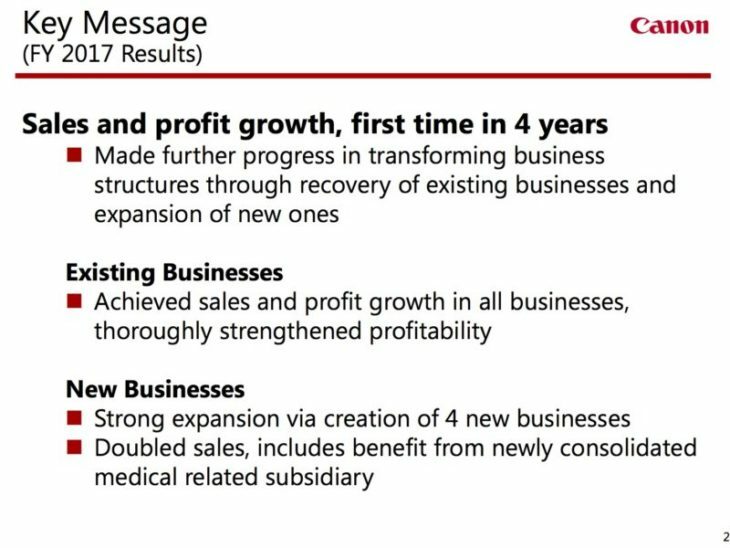 No surprise here: Canon is doing good, not least because of their investments in medical and security domains. 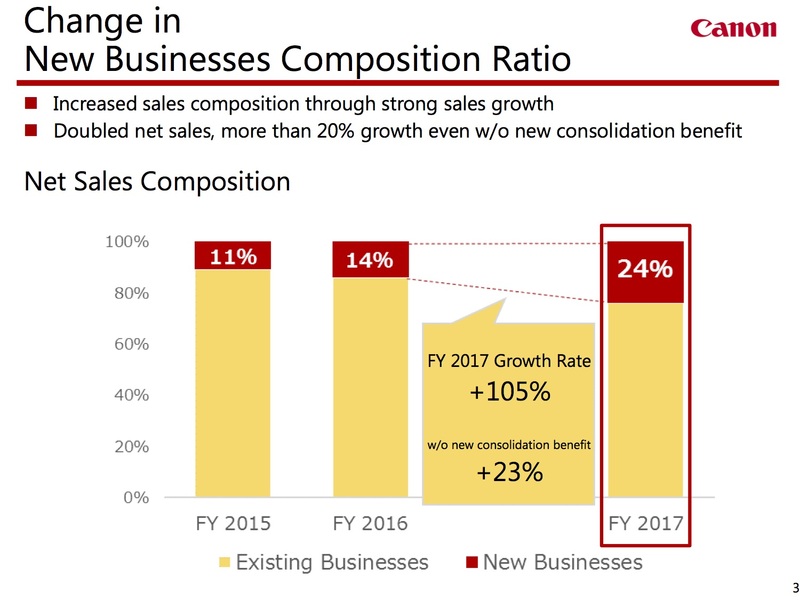 Looking at Canon’s full-year performance by business unit, beginning with the Office Business Unit, unit sales of office MFDs increased from the previous year and achieved higher growth than the market average, supported by steady sales of next-generation color models designed to strengthen the product lineup such as the newly launched color A3 (12”x18”) imageRUNNER ADVANCE C3500 series for small- and medium-size offices. Among high-speed continuous-feed printers, unit sales of the Océ-produced VarioPrint i300, a high-speed sheet-fed color inkjet press that offers superior low-running-cost performance, increased. 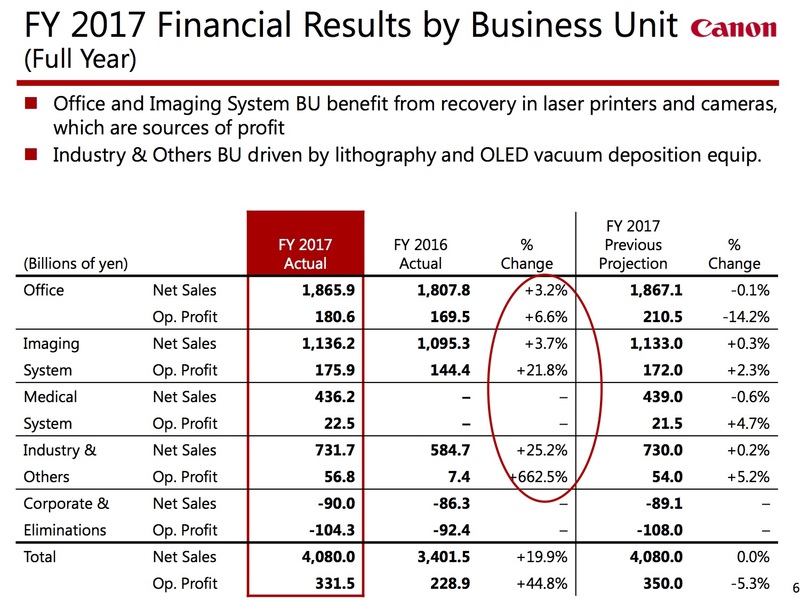 As for laser printers, sales of both hardware and consumables increased from the previous year, supported by steady sales of new models that achieve low power consumption and compact body designs. 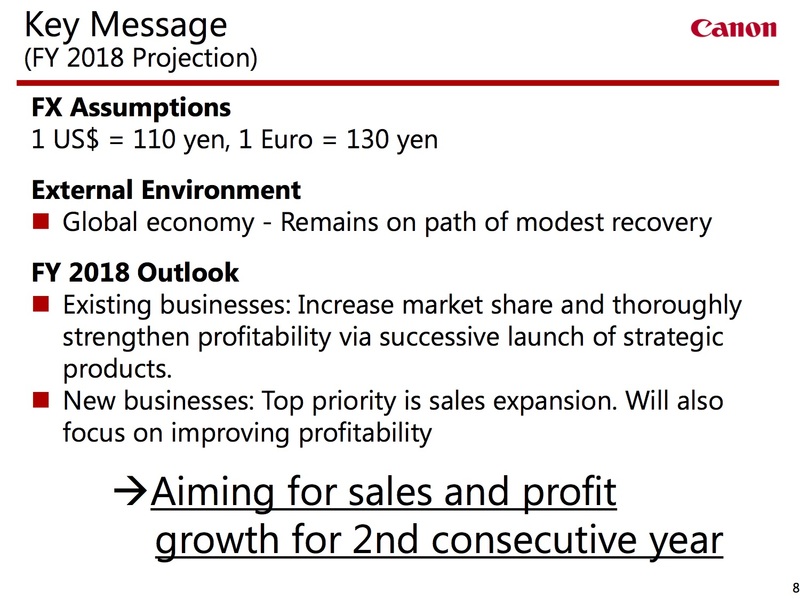 These factors resulted in total sales for the business unit of ¥1,865.9 billion, a year-on-year increase of 3.2%, while operating profit totaled ¥180.6 billion, a year-on-year increase of 6.6%. 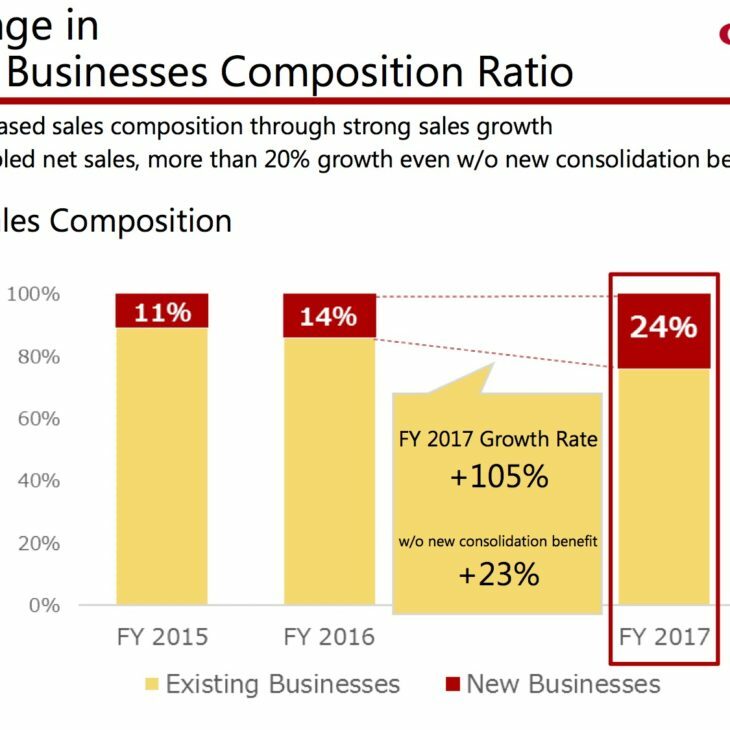 Adjusted operating profit, which excludes impairment losses on goodwill from operating profit, increased by 26.6% to ¥214.6 billion. 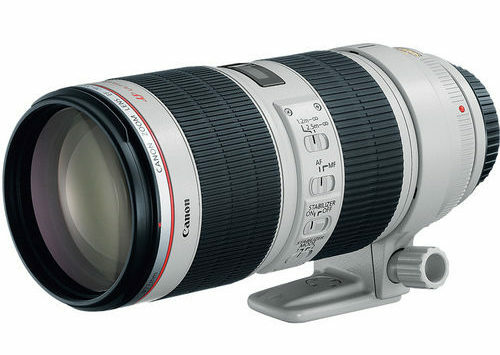 Within the Imaging System Business Unit, while the pace of decline in demand for interchangeable-lens digital cameras is gradually decelerating, the sales of the advanced-amateur-models —including the EOS 6D Mark II—enjoyed solid demand, allowing Canon to maintain the top share, mainly in the United States, Europe, and Japan. 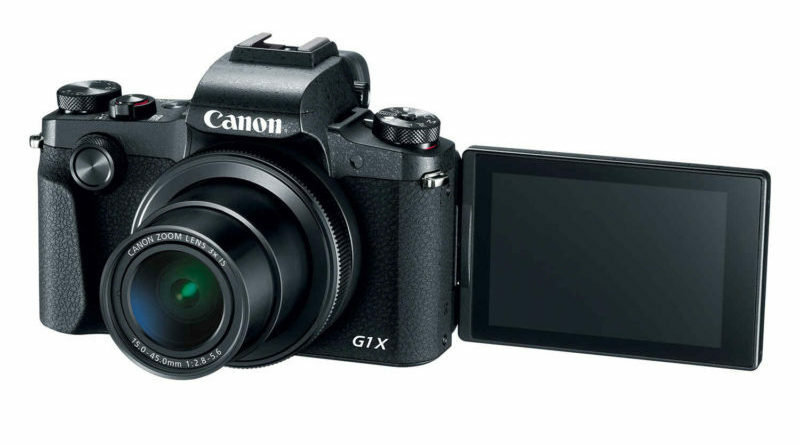 As for compact-system cameras, the advanced-amateur-model EOS M6 and the entry-level EOS M100 enjoyed strong demand. 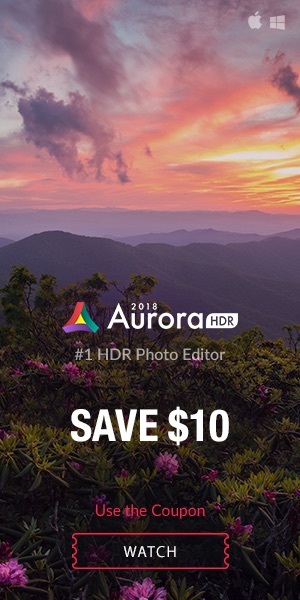 As for digital compact cameras, amid the shrinking market, unit sales remained at the same level as the previous year, supported by the increased sales of such high-value-added models as the newly launched G9 X Mark II—part of the high-image-quality PowerShot G-series lineup. As for inkjet printers, the newly designed home-use TS-series, refillable ink tank models targeting emerging countries and the imagePROGRAF PRO series of large format inkjet printer targeting the professional photo and graphic art markets enjoyed strong demand, resulting in unit sales increasing from the previous year. 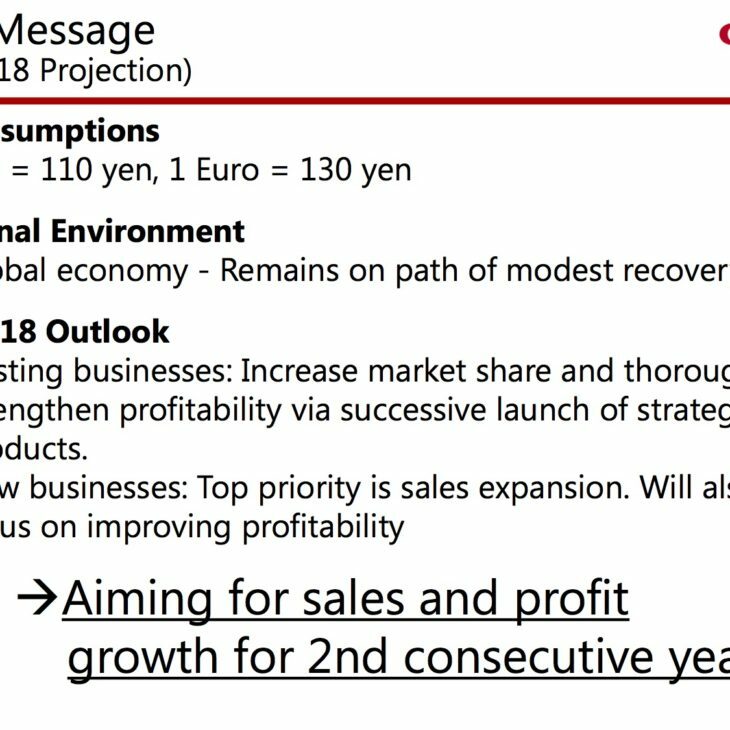 As a result, sales for the business unit increased by 3.7% year on year to ¥1,136.2 billion, while operating profit totaled ¥175.9 billion, a year-on-year increase of 21.8%. As for the outlook for 2018, the U.S. economy is expected to recover stronger as corporate earnings and capital investments steadily improve thanks to tax reform. The European economy is expected to recover slowly due to increasing uncertainty surrounding the U.K.’s decision to leave the EU, although consumer spending is expected to remain stable due to solid employment conditions. Looking at China, the economy is expected to stabilize through public investments and solid consumer spending. Emerging economies, including Southeast Asia, are expected to continue to grow due to strong exports. With regard to the Japanese economy, the outlook indicates a trend of gradual recovery supported by improved employment conditions and consumer spending. Overall, the global economy is expected to continue achieving moderate growth, despite such concerns as increasing geopolitical risks.